CONSTRUCTION work will soon begin on the development of Woodlark Island gold mine project in Milne Bay Province. 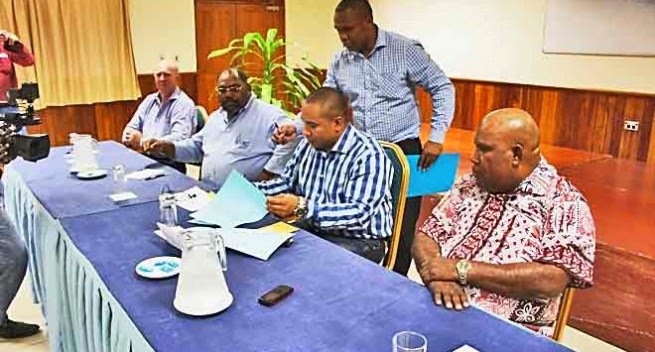 This follows the signing of the mining lease by Mines Minister Byron Chan at Alotau International Hotel on Friday, a month after the Mining Council approved the lease for Papua New Guinea’s latest small-scale gold mine project. Minister Chan; Governor Titus Philemon; CEO of Woodlark Mine Limited and managing director of Sydney-based parent company Kula Gold, Stuart Pether; Mineral Resources Authority managing director, Philip Samar; and landowner association chairman Davidson Aisi all hailed the signing as a very special and historic occasion for all the stakeholders. “Today is a very special day for the people of Woodlark, Milne Bay and Papua New Guinea. With the signing of the mining lease, the company can start work on developing the mine,” Minister Chan said. The signing of the mining lease took place despite the fact that the land ownership issue has yet to be resolved. The Woodlark gold mine project is a unique case for PNG because most of the land on the island is owned by the State. Governor Philemon fully supports the people and has made it his 2012 election platform to help revert ownership of Woodlark land back to the people. The National Government has noted the people’s concern and Minister Chan reiterated the O’Neill-Dion’s commitment and assurance that the land will be given to the people before the MOA for the Woodlark mine project is signed. The MOA will define the benefit-sharing arrangements for mining equity, royalties, training and employment, business opportunities and other benefit streams as well as respective responsibilities for the National and Provincial Governments, the developer, landowners and other stakeholders. Speaking for his people and provincial government, Governor Philemon said they would not support the signing of the MOA until the land issue was resolved. “This is our stand... We are not talking only about the land on the mining lease but the entire land of Woodlark island,” he said. Minister Chan said: I acknowledge the letter from the governor requesting that the land issue be resolved before the MOA is signed. The Prime Minister has already directed the Minister for Lands to act on the land titles. “Portions of the land will be reserved for public purposes but other portions are are being dealt with. The secretary for Lands is dealing with the matter as we speak,” he said.